Chemotherapy can be described in many ways, and unexpectedly, one of them is boring. Sitting in a chair, sometimes for 10 hours, to receive treatment does not have to be totally tedious, as our Art by the Big Blue Chair program shows. 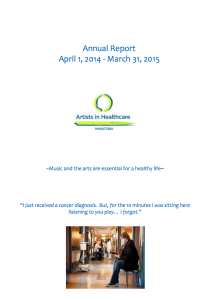 Artists in Healthcare believe that music and the arts are essential for a healthy life. Artists in Healthcare brings live music and arts to patients receiving treatment in oncology, palliative care, rehabilitation and dialysis. On units throughout hospitals in Manitoba our unique programs provide important benefits for patients, families, and staff as an oasis from stress and anxiety often found in these environments. Our year round programs take place at St. Boniface and Grace Hospitals, CancerCare Manitoba, Foyer Valade, Jocelyn House, Brandon Health Centre, Boundary Trails and Bethesda Hospital in Steinbach, and are coming soon to the Health Sciences and Tache Centres. 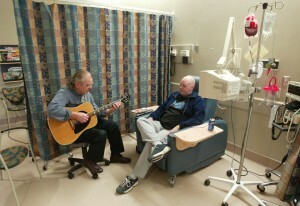 Artists in Healthcare musicians play for over 7,000 patients in Manitoba each month. The Service Canada Summer jobs programs hires up to 9 student musicians, who add another 2,500 hours of programming at 11 hospitals and long term care facilities. Our hope is to expand our organization and develop a base of supporters who value the important work of our artists and musicians in health care. We welcome simple demonstrations of support, such as “Liking” our Facebook page, linking to it on your website, or through spreading the word about the valuable work of our organization. You can make a financial donation either to the mailing address below, or at www.artistsinhealthcare.com by clicking on the link which takes you to the secure website, Canada Helps. We greatly appreciate your support and are happy to acknowledge any donations over $50 with a tax receipt. was begun in 1999 by artist Shari Johnston and nurse/artist Susan Johnston. Shari had a dream. As an active painter and sculptor, “and having been in and out of dreary hospitals” in her younger years, she “had always wanted to bring the healing aspects of the arts to Winnipeg patients via an in-hospital art program”. Susan said to Shari; “With your ideas and my energy, we’re totally capable of setting it up”. This was the beginning and that Johnston inspiration still motivates our board staff. The organization was incorporated in 2001, “set up shop” in St. Boniface Hospital in January 2002 and was awarded charitable status in April 2002. Shari’s and Susan’s goal was to bring MAH to every hospital in the province. This goal is being accomplished with AIHM’s thirty professional and student musicians, volunteer artists and musicians, three program coordinators, and the commitment and dedication of the Board of Directors and Executive Director, Shirley Grierson. Quotes by Shari and Susan appeared in Canadian Living, “Creative Hearts Are Better than Drugs” September 2003. Artists can experience and explore the value of their work to contribute to health and wellness with patients. Artistic practice can be informed and deepened as meaning is explored. New employment opportunities for artists in health care. Arts exposure provided to a unique and typically underserved community. Creation of new gallery spaces.